Here are my tweets from Day 1 of the Bates v Post Office common issues trial, tidied up for legibility and formatting. Please do follow me on twitter if you can @nickwallis. Read the originals here. #postofficetrial - Patrick Green QC opens for the claimants. Judge interrupts to note there has been an application from PA to get hold of the opening arguments. Judge suggests it should not be a problem for the media to see them. Nods in agreement from claimants and defence. 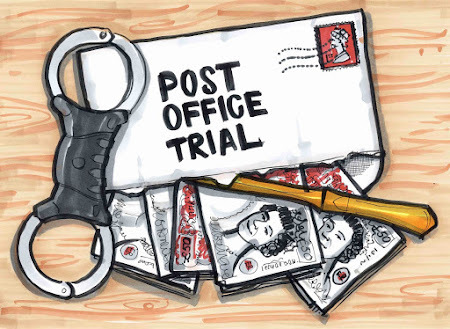 If this is all new to you, please have a look at www.postofficetrial.com - backgrounder to a case in which 560-odd SPMRs are suing the @PostOffice for a lot of money. Green talking around the procedures for raising and dealing with an accounting discrepancy on the Horizon system and the changes that were brought in in the 00s. “The TC shows up on the screen at the end of a trading period and they can either defer dealing with it, pay it in in cash, or settle centrally… there is NO option to dispute a discrepancy on the Horizon system as the defendant admits in its defence." Green says the SPMR might then find themselves signing off an account with which they disagree. This is all a little arcane, but it goes to the heart of the problems many SPMRs had with POL. To keep trading they felt they had to settle or accept a debt (sometimes tens of thousands of pounds) in order to keep trading. From what I have read so far, the Post Office will likely disagree with this characterisation of the way the system should work. The basic point that Green seems making is that the Post Office is control of the Horizon IT accounting system, including the terminals in the branch. Not the SPMR. And that the limited information the SPMR gets about accounting and cashflow is narrower to the PO's. Green has started referring in court to the story of Pam Stubbs, a Berkshire SPMR who I filmed for BBC Inside Out South in 2014 (?). Pam had huge sudden accounting discrepancies when she moved her PO (and Horizon) in to a temp cabin whilst her branch was being renovated. Pam had a discrepancy of more than £5000. She called the helpline who told her to check again. Pam wanted to put it into dispute. Pam tried to find the source of her discrepancy through her own paperwork and terminal. She couldn’t. The PO told her to pay it. Green is pointing out that mechanically - even whilst raising a dispute about a sum with the helpline - mechanically the SPMR has to agree a TC on their Horizon terminal, which then creates a debt. Pam stubbs then receives a letter from the PO demanding the repayment of the “outstanding debt”, despite the fact she is disputing it. Pam requested direct access to Fujitsu (who run Horizon). PO said they would contact them themselves. PO came back saying Fujitsu told them there was no problem with Horizon. PS’s witness statement refers to another apparent shortfall of £26K which happened when the PO’s cash centre failed to record a large cash remittance from PS’s branch…. he draws the parallel between that and the mysterious earlier problem. If the PO could easily miss £26K, why wasn’t it likely the £5K discrepancy was their problem. Not hers, especially when they couldn’t tell her how it was her debt. Green is explaining the devil’s bind so many SPMRs have explained in the past. carelessness or error, and also for losses of all kinds caused by his Assistants. Deficiencies due to such losses must be made good without delay." Green pointing out this clause was written before the rollout of Horizon which “completely changed everyone’s way of working” yet the contractual relationship remained the same. Just had a 10 minute break to help the stenographers' hands recover. We are back to Pam Stubbs case. Green reveals an internal email only uncovered through disclosure in this trial in which a PO manager states baldly, having visited the branch that the problem she is having is definitely a Horizon problem. Green says PO denies Horizon has caused..
... a problem for any SPMR claimant. He now points out this document shows a) how hard it is for SPMRs to prove any problem with Horizon and b) that a PO manager is stating quite clearly Horizon caused the problems in her branch. Green now talking about another Horizon system-wide error referred to a PO internal memo dated 17 Oct 2012 in which branches could be put out of pocket by the error. Worried this error could cause loss of confidence in branch. "What the claimaints are trying to do is water down the agency principle relationship almost to vanishing point to say it is basically marginal." Interesting line from PO QC - "the Lead Claimants are not test cases…. We could have had 10 notional cases. You must be very careful of what regard you have of their experience being relative to others - because they’re not." That is a Bold Claim. PO QC makes it quite clear that PO would never go after losses caused by Horizon under the terms of S12.12 of the contract (see previous in thread). Because a Horizon fault, is de facto not an SPMR error. He also appears to be saying the Post Office is entitled to show a loss to an SPMR on Horizon as a loss because it can infer there is no Horizon fault due its general reliability. Judge points out that that means if Horizon says x, x being a shortfall, then there is a shortfall. This is accepted by the PO QC. So it is now accepted by the PO that it is reasonable for Horizon to throw up a loss, and because it is generally reliable, it becomes a real loss, which as we found out this morning has to be accepted by the SPMR even if they put it in dispute. And that the burden of proof on discovering the source of the loss, under terms of 12.12 of the contract is on the SPMR. Judge really pushing back on this: "your ‘gateway’ [to creating a burden of proof on the SPMR to identify the source of the loss] is a step that’s reached after you reach an inference that Horizon is reliable." QC says it’s on the PO. Judge invites QC to read transcript of what just happened in court carefully later as he’s not sure it makes a lot of sense. QC says if my Lord reads my opening submission…. Judge interrupts to say no need to use the conditional. I’ve read it twice. And I will read it again. Interestingly the judge has the capacity in this court to pause the proceedings and go back over the transcript of the last few minutes to refer to precisely what was said in court on his screen. Whilst having the discussion about the transcript transcribed. We’re now talking about the implied terms of the SPMC. PO QC notes that just because they have accepted there are some specific implied terms in the SPMC, it doesn’t mean there can be others. Or that the contract was badly drafted. Particularly pushes back on JFSA QC’s invitation to accept JFSA's implied terms on the SPMC and then have the PO tell the JFSA what they mean. PO QC says SPMC is not a relational contract because it is not a long term contract which is a pre-requisite of a relational contract and SPMRs can be given 3 or 6 months notice. PO QC says therefore JFSA’s relational argument doesn’t get out of the gate. … and indeed whether or not the SPMC is relational anyway. The argument I think is that it isn’t, because a) there are things which define a relational contract which the SPMC does not have and b) even if it were, then the “doctrine of good faith” is not general, but v narrow. Judge says relational and definitions of relational contracts “is an area of some debate”. PO QC pushing again on definition of a relational contract. Judge: "My understanding of the term relational contract is that it has an element of good faith. That might be right or wrong." PO QC “I think it might be wrong." PO QC suggests we are descending into semantics. Judge says no actually it is important because he has to decide on the common issues in this trial, including cooperation and good faith. We’re now onto the likely evidence of the Lead Claimants. PO QC accepts that but also says he will want to challenge the evidence of the Lead Claimants. PO QC asking how evidence which comes forth from cross examination will be treated. Judge says that is probably best dealt with in closing. PO QC is wanting to know how Lead Claimaint evidence will be used because it could have material bearing on this and other trials. Starting to finish up now. PO QC “This is an extraordinary case... in that we don’t know what the other side is saying." A bit more discussion about timings and logistics and then we are done for the day. Alan Bates, founder of the Justice For Subpostmasters Alliance gives evidence tomorrow and will be cross-examined.